Chinatown Point is right opposite the hotel. Bayfront MRT station (access to Marina Bay Sands Hotel & Garden by the Bay) is 3 stops away from Chinatown station via Downtown Blue color line. Harbour Front MRT station (gateway to Vivo city, Sentosa island & Universal Studio) is 2 stops away from the Chinatown Station via NorthEast Purple color Line. The Orchard Road is as close as 2 MRT stations away at Dhoby Ghaut station via NorthSouth Red color line. By Taxi: 19.7 km away and about 30 minutes drive to the hotel. Estimated fare will be $25-30 dollars. Harbourfront Cruise Centre & Ferry Terminal is at Harbour Front MRT station is 2 stops away from the Chinatown Station via NorthEast (purple color) line. It is 4.8 km away and about 10 minutes drive from the hotel. Marina Bay Cruise Centreis 5.7 km away and about 10 minutes drive from the hotel. Harbour Front MRT station is 2 stops away from the Chinatown Station via NorthEast (purple color) line. Proceed to Vivo City Shopping Mall level 3 for the Sentosa Express, transport to Universal Studio and Sentosa Island. are just 7 to 10 minutes walking distance away. 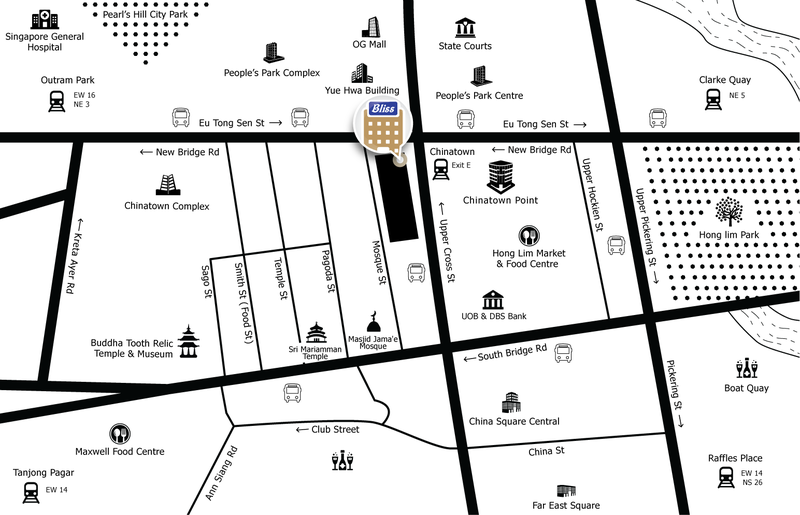 is just 3 stops away to Bayfront MRT station from Chinatown station via Downtown (blue color) line. is as close as 2 MRT stations away at DhobyGhaut station via NorthEast (purple color) line. Access to Johor Bahru, Malaysia is about 35 km away and reachable within 30 minutes drive.